He continued to pray to Her earnestly from the innermost depths of his heart, so much so that he was even prepared to sacrifice his life! 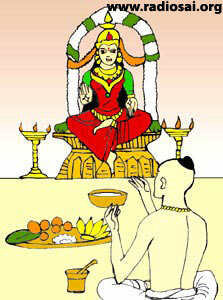 Sankara told himself, “My father asked me to offer this milk to the Goddess but I am not able to do so because the Goddess is not receiving the offering, which I made. It is better that I die”. He went out and brought a big stone to kill himself. But the compassionate Mother, the Mother of the Universe could not keep herself away for too long. Moved by Sankara’s unsullied devotion and sincerity, She at once appeared before him and drank the milk that he had offered and then placed the empty cup before him. The boy was very glad that the Mother of the Universe came and drank the milk. But now there was nothing left in the cup. He thought that his father would certainly ask for the naivedya (consecrated offering) of the God when he returned. He feared that his father may think that he drank away all the milk and hence may become angry with him. And therefore he prayed to the Goddess again. 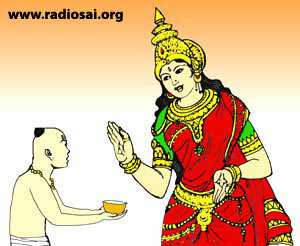 This time asking Her, “O Mother, Please give me at least a drop of milk so that I may be able to give it to my father”. But the Goddess did not come. He again sincerely continued to pray; the Goddess was yet again moved by his love and faith and She appeared before him. But since She was not able to give the milk that She drank, She gave Her own milk and filled the cup! It is believed that because Sankara was blessed to taste the Divine milk, he could attain the highest pinnacle of knowledge and wisdom. 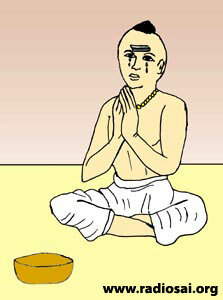 But the main essence of the story lies in the son’s blind and complete devotion to fulfill his father’s wishes. Because Sankara tried hard to please his father, he was able to get the Goddess of the Universe to manifest Herself before him. Revering and obeying the orders of our parents hence is but only a way to earn the grace and blessings of our divine parent.